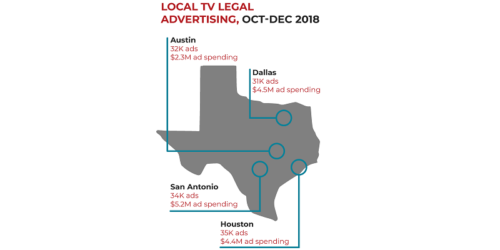 March 21, 2019 (WASHINGTON) — Today, the American Tort Reform Association released a study showing spending on TV ads by trial lawyers in Texas’s largest media markets. “Don’t settle for quick cash! Call now to get what you’re entitled to!” If it feels as though these ads flash across the screen nearly every commercial break, it’s because they do. 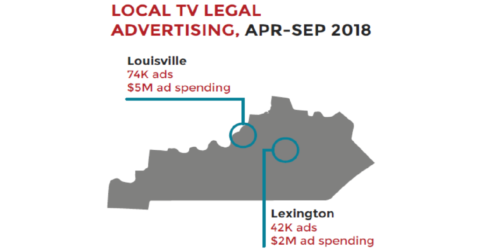 In the second and third quarters of 2018 (April 1 – September 30), nearly 6 million ads for legal services aired on local broadcast networks in the 210 local media markets across the U.S. – totaling $412 million in spending to purchase these ads. 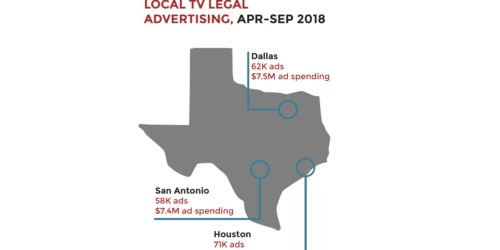 Texas’s largest media market and fifth largest in the country, Dallas-Ft. Worth, saw $7.5 million spent in its local television market to air nearly 62,000 trial lawyer ads between April and September of 2018. DFW viewers saw an average of 344 legal services ads every day – that’s 11 times as many ads as viewers saw for home centers and hardware stores. 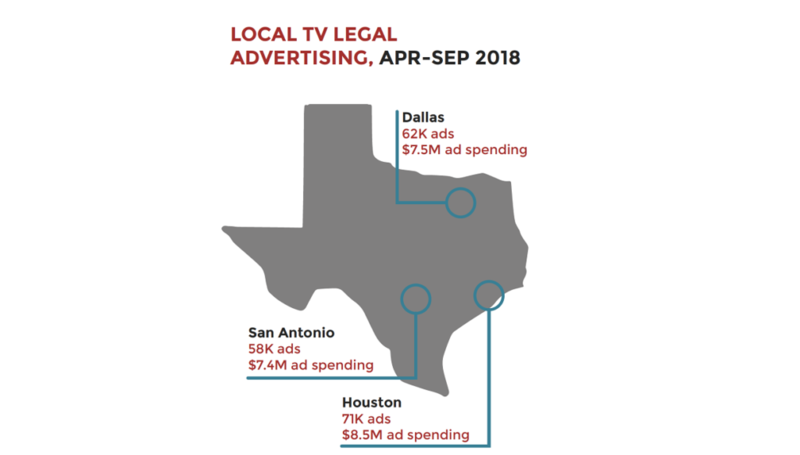 In the Lone Star State’s second largest media market and the nation’s seventh, spending in Houston outpaced DFW by nearly $1 million with a total of $8.5 million spent to air more than 70,000 trial lawyer advertisements between April and September of last year. 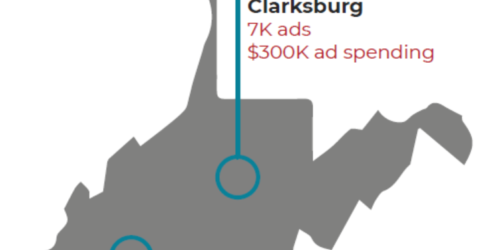 During the third quarter alone, a daily average of $51,000 were spent on approximately 394 ads per day – that means these ads ran 19 times as often as ads for pizza delivery and restaurants. In the third largest market, San Antonio, $7.4 million were spent to air nearly 58,000 ads. There was a 37 percent increase in spending between the second and third quarters – $3.1 million in the second quarter compared to $4.2 million spent in the third quarter. In San Antonio, area viewers saw ads for legal services 12 times as often as they saw ads for clothing stores. House Bill 2251 (Giovanni Capriglione – Tarrant County) and Senate Bill 1189 (Dawn Buckingham – Travis County) both aim to rein in deceptive legal advertising practices, and curb some of the issues that can arise from these ads. A Public Opinion Strategies survey found that three-quarters of Americans saw ads by law firms about pharmaceutical lawsuits in 2016. The survey goes on to say that one-in-four people who saw one of these ads concerning a medicine they take, say they would immediately stop taking the medicine without consulting their doctor. The FDA found that 61 patients stopped using their prescribed blood-thinner medications, Xarelto or Pradaxa, after viewing these commercials in 2016. Six of the patients died – three from stroke, one from cardiac arrest, one from a pulmonary embolism, and one from an unreported cause. H.B. 2251 is scheduled for a hearing Monday in the House Judiciary & Civil Jurisprudence Committee while S.B. 1189 is expected to be heard in the Senate State Affairs Committee early next week. To view the full report on trial lawyer advertising, visit ATRA.org. About the American Tort Reform Association (ATRA): Founded in 1986, ATRA is a nonpartisan, nonprofit organization with affiliated coalitions in more than 40 states. It is the nation’s only organization dedicated exclusively to reforming the civil justice system through education and legislative enactment, and acts as a nationwide network of state-based liability reform coalitions backed by 135,000 grassroots supporters. ATRA works to bring greater fairness, predictability and efficiency to America’s civil justice system. Those efforts have resulted in the enactment of state and federal laws that make the system fairer for everyone.